WorldLink TV aspires to be the anti-network. So it's operating as a nonprofit and setting out to become the first national channel dedicated to providing Americans with global perspectives. 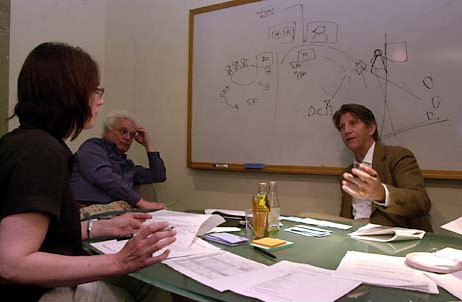 A production meeting has been going on for more than two hours in the small conference room of WorldLink TV on Battery Street. The sandwiches are long gone, the room is starting to get uncomfortably warm, and the team is only halfway through reworking the script for the next night's taping of the new satellite network talk show, "The Active Opposition." Peter Coyote, the actor/author/activist and now TV host, reads aloud from a script he's written for himself. "Back to Washington, to Arjun Makhijani. As a scientist and specialist in nuclear fission, what is the public not being told about the dangers we face?" David Michaelis, a respected Israeli television journalist of many decades, dryly notes: "That question could result in a five-minute lecture." Coyote responds in semi-mock indignation. "Well what's wrong with that? We want to save the world from imminent destruction, but it has to be catchy! And in sound bites no longer than 30 seconds!" The group chuckles. They know that while this may be true of network TV talk shows, where experts are trained to make points in vociferous sound bites, quite the opposite is true of "The Active Opposition." On this 90-minute, no- commercial-interruptions talk show, guests are allowed, as producer Stephen Olsson puts it, "to speak freely, to actually develop and explain a thought, idea or position." "The Active Opposition" is the second from-scratch program produced by the nonprofit WorldLink channel, which went on the air 2 1/2 years ago on DirecTV Channel 375, and Dish Network Channel 9410, after raising a modest $3 million in grants. Its lofty aim: "to introduce American viewers to voices, nationalities, and perspectives not available in the U.S. mainstream media." But it was WorldLink's first original program -- "Mosaic," a daily half hour of selected news reports from the Middle East, uncensored and translated - - that put it on the media map. During the early days of the war in Iraq, the channel was discovered by those who were hungry for the perspective that could only be found in the war zone, and its viewership rose to an estimated 4.5 million a week. ABC's Peter Jennings, in a recently filmed story about WorldLink, called it "television without borders." "The Active Opposition" was hatched as an idea after a chance meeting in a Marin restaurant between Coyote and Olsson, who has produced documentaries around the world for 20 years, including the Emmy-nominated "Last Images of War." Funding was sought and quickly granted by the John and Geraldine Cusenza Family Foundation, which is devoted to "cross-linking humanity." This is the fifth show so far; one show is taped each month, played live at first and then rerun several times, and streamed on the Web site, www.worldlinktv.org. 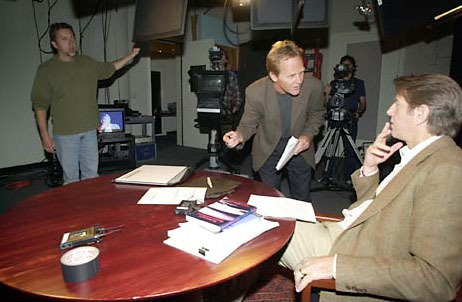 The show's have included "Iraq: Eyewitness Reports," which featured Sean Penn's first major interview after his fact-finding trip to Baghdad, and "Your New$ and the Bottom Line," an exploration of the impact of media consolidation, featuring a powerful diatribe against it by none other than Walter Cronkite. Needless to say, this show would be like mother's milk to fans of Utne, "All Things Considered," Mother Jones and Alternet.org -- and would drive fans of Michael Savage and Bill O'Reilly up the wall. Olsson resists slapping a left-wing label on it. "We're simply committed to presenting information and points of view that are often censored or marginalized by our government." Adds Michaelis: "These subjects are not the bread and butter of the mainstream media." This month's bell-ringer: "The Nuclear Lullaby: What We Are Not Being Told. " Within 15 minutes of listening to the explosive (no pun intended) material presented, an eavesdropping reporter wants to go and build a bomb shelter. Still, the team haggles over the wording, aiming for just the right balance of inflammation and information. "I think 'What We Are Not Being Told' might sound too National Enquirer," offers co-producer Toni Whiteman. Coyote sighs, grinning. "Well, civility is over. But we're trying to save the f --ing world, people!" Coyote provides the idealistic passion for the production team; it takes the rest of them to balance his charismatic zeal with cool-eyed journalism. "It's hard to wait for the experts to say some of the things I want to say, because I'm a total bigmouth," Coyote says, laughing. "But it's good, because no one would listen to me, and no one should listen to me -- I'm just an amateur student of all this." But whomever the spokesman is taken to be, it's a formula that seems to be working. "The Active Opposition" is garnering fans -- including a famous one named Willie Nelson, who called Coyote to express admiration and ask if the producers would devote a program to the crisis of America's farmers. They are considering it. By the end of the four-hour meeting, the team is getting seriously punchy. There is a debate as to whether nuclear weapons held by Israel should be called "a Jewish bomb." Michaelis wonders if they should call George Bush's weaponry "a born-again Christian bomb." And when Coyote utters the last line in his script, "Good night, from WorldLink television," Olsson adds dryly, "and have a nice day!" The following night, after a minor crisis that erupts when author Jonathan Schell ("The Unconquerable World") says he can't stay until the end of the taping -- 11:30 on the East Coast -- all seems in readiness. Coyote must juggle a guest in the San Francisco studio (Dan Fahey, conscientious objector from the Gulf War), three experts in the WorldLink Washington studio (Rep. Lynn Woolsey, D-Petaluma; Jonathan Granoff, president of the Global Security Institute; and Makhijani, president of the Institute for Energy) and one in New York -- Schell, who has to get up early to teach a class. Coyote runs through his intro before the camera to get sound levels. Impassioned yet even, he exhibits no rattled nerves. It's a surprisingly sophisticated operation, considering WorldLink's staff numbers only 27. But up until 10 minutes before show time, there is no transmission from Washington. At all. Finally, with a burst that draws a cheer, the three panelists appear onscreen and are asked to get miked up. Olsson turns and with a war correspondent's glint in his eye, tells the troops, "This is where it gets fun."